To achieve a certain grass height on a lawn or section of a lawn, you need to set the wheels on your lawn mower to that height to obtain the desired results, which requires you to raise or lower the wheels on the lawn mower. Most lawn mowers are set to lower heights at the store. Setting the wheels higher on your lawn mower is not a difficult task. You can accomplish it by hand with few, if any, tools, depending on the age and design of the lawn mower. Look at the sides of the lawn mower near the wheels. You will see a lever with a black cap on it sticking up or out from the mower deck; the lever will be either extending from the top, front or back of the mower deck. Look at the base of a lever and notice a semi-circular metal piece with holes in it. The lever will have a spur which is in line with the holes in the semi-circular piece and is inserted into one of the holes. Put on work gloves for protection. The entire lever is under great pressure while holding the wheel on the lawn mower in position. The lower end of the lever also has the possibility of being rusted or dirty from the operation of the lawn mower. Kneel down next to the wheel you are raising. 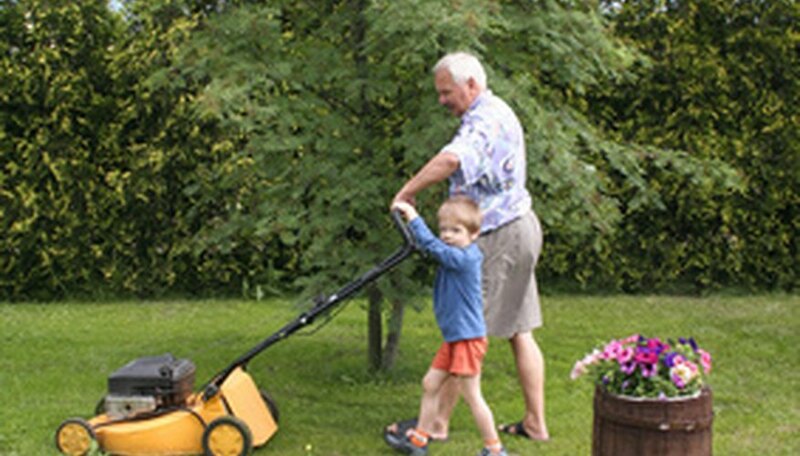 Use one hand to lift the wheel off the ground by lifting the mower deck just behind the wheel. Use the other hand to move the lever into a new position. Push on the broad side of the lever gently and increase pressure as you push the lever slowly. Press the lever back until you hear the spur of the lever pop out of position from the mounting hole. Slide the lever to the right. Allow the lever to click into position in the next hole of the semi-circular piece, which raises the wheel on a lawn mower ½ inch. Repeat this process if you want to raise the lawn mower wheel higher. Repeat steps 4 and 5 for each of the four wheels. Make sure the wheels are all the same height by making note of how many holes you moved the initial lever from the original position to get the desired height on that wheel.